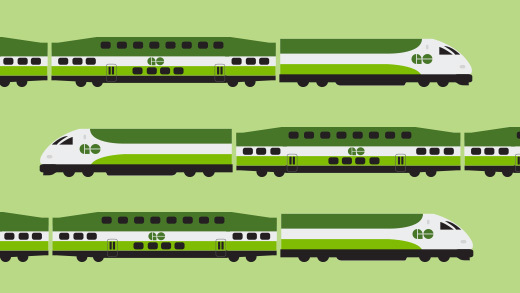 On April 8th, we added more GO train service between Bramalea GO and Union Station on the Kitchener Line, and midday Stouffville line trains extended to Mount Joy GO. On April 17th, we're adding new train trips on the Lakeshore East Line, giving you more choices to get you where you need to be. We're adding two new Lakeshore East trips that will stop at Oshawa, Whitby, Ajax and run express between Pickering and Union, making GO an even better fit for your workday schedule. A new trip from Oshawa GO at 7:50 a.m. will stop at Whitby at 7:56 a.m., Ajax at 8:04 a.m. and Pickering at 8:09 a.m., then run express to Union, arriving at 8:42 a.m.
A new trip from Union at 4:50 p.m. will run express to Pickering, arriving at 5:23 p.m., and stop at Ajax at 5:28 p.m. and Whitby at 5:35 p.m., and arrive at Oshawa at 5:43 p.m. The trains for both of these new trips will have 12 coaches to give you as much room as possible. We’re giving you relief where you need it! Now, there will be new morning trips between Bramalea GO and Union Station that will give you more options when you need them most. A new trip from Bramalea GO at 7:55 a.m. will serve all stops before arriving at Union at 8:33 a.m.
Plus, the 8:33 a.m. existing trip from Malton GO will now serve Bramalea GO at 8:27 a.m., arriving at Union at 9:05. We’re increasing comfort on the Stouffville line, by extending your midday GO train service to all stations in the City of Markham. GO buses will connect customers from Lincolnville and Stouffville GO stations to trains at Mount Joy. Check here for new Schedule Details, or use See Schedules to plan your trip today! Remember to get real-time updates sent directly to your mobile device with On the GO alerts or by following a line-specific @gotransit account on Twitter.